Oil transportation is an effective activity closely linked to oil business. Petrolimex, therefore, invested in modern and fully conditioned means to reach out to world oil markets. The Corporation now owns a fleet of ocean going tankers of an aggregate tonnage of 158,000DWT, more than double that of 2000, a fleet of coastal and river tankers of about 100,000 tons, a 500km pipeline and more than 1,2000 tank trucks of an aggregate capacity of 9,000cbm operating in Petrolimex member companies, ensuring the transport of oil from abroad to Vietnam and from oil terminals to smaller ports and consumption agents nationwide. 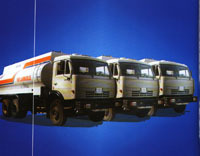 The contingent of Petrolimex officers and crew are experienced and skillful, professionally trained together with the modern tanker fleet always satisfy international classification societies at home and abroad and requirements of IPPS Code relating to ship and port safety, and is recognized by world oil firms. Thus, oil transport sector has contributed to the build up and reconfirmation of Petrolimex prestige of today.